Chaos is glorious. Chaos reigns supreme. The sheer power of chaos is limitless - and the strength of those who wield it is unbounded. Chaos is not so much the absence of order as the presence of infinite permutations of order, of possibility, each complete in and of itself and awaiting the moment, be brief or eternal, when it will impose its structure on reality. The chaos mage is the ultimate architect of this imposition, changing the fundamental nature of reality to what he wishes it to be. 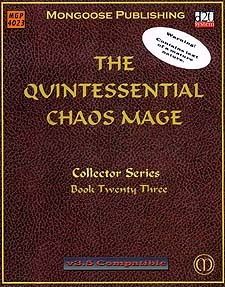 The chaos mage is the antithesis of the wizard and the sorcerer. While their magic is all complex formula, rote recitation and memorisation, his magic is freeform and limitless, like chaos itself. For the chaos mage, there is no such thing as the impossible, merely the improbable. Their art is a magic of universal potential, of destruction and building, beginnings and endings. In short, chaos magic is the stuff of creation. Now, that magic is yours to command.